The SA Champs were run over the weekend of 21-22 November at the awesome Constellation Club field. 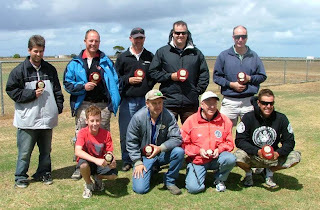 We had a final total of 16 Pilots competing in Sportsman, Advanced, Expert and F3A, with a good contingent from Victoria making the trip to Adelaide for the competition. Rob Clarke arrived with a new Inspec, and typical of OXAI planes. It looked fantastic. This one was powered by the less expensive Hacker ACRO (not Competition) and hauled it around very nicely ( . . but it WAS cool weather ;o). Unfortunately, I didn’t get a pic of it . . but you can see them on the OXAI web site :o) I can say that it looks to fly really nice, and I am a little surprised we have not heard a LOT more of this plane. 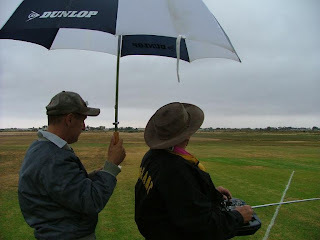 Saturday started with showers on and off, however with quite calm conditions, we erected a ‘quick-shade’ cover for the judges and a couple of umbrellas were organized for the competitors, and commenced on time. 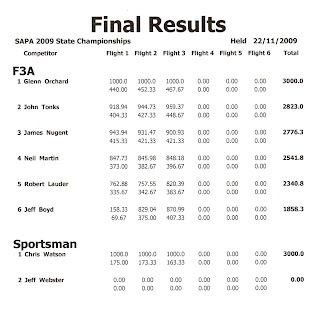 The flying was of a good standard, with quite a few putting in noticeably good flights. marred by a questionable stall into the spin. Victoria’s GlennO by his own admission had not flown much, and was disappointed in his first round, although it looked OK. His second and third rounds certainly had the cobwebs blown out. Victoria’s young James Nugent was also flying consistently well. I had had engine problems leading up to this comp, and the flame-out in the first round was almost expected . . great start. But thinking it was a long two days, I wasn’t too bothered. 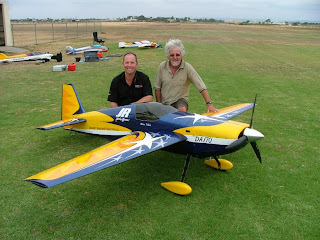 It is always good to see Rob Lauder over here from Geelong flying with us. He mentioned that he had not flown much recently, but his flights still looked quite tidy. than I had seen him fly for some time. Rob had been flying Biplanes for a while, and the Inspec monoplane seemed to suit him better (in my opinion). 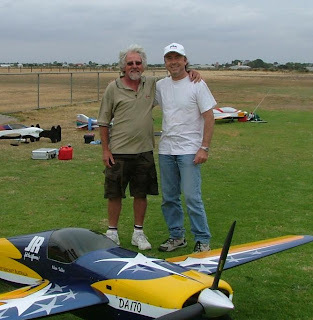 SA’s Peter Ukhoff has been improving all the time with his Integral and is flying well, while Victoria’s Henry Hutchinson was also putting in some good flights with one of his trusty Cyclones. Advanced class had the Victorians of Darren Williams, David Nugent, and Graham Prestige (ex. South Ozzie!!) flying against the lone SA pilot of Jeremy Reynolds. Darren looked to be flying well, although Dave seemed to be putting it together too. Graham was having a ball ! He just always seems to have so much fun, no matter what happens ;o) . . and SA’s Jeremy was flying tidy with his Angel 50. 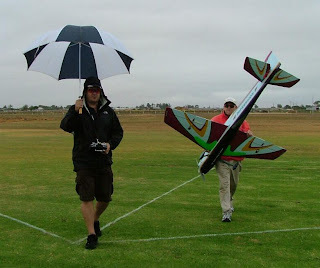 Sportsman class saw SA’s Chris Watson as the lone competitor. . and flew well scoring well. During the day, Mike Briggs (the father/caller/mechanic of Frazer Briggs, 2004 Tucson Shootout winner) turned up, all the way from New Zealand. 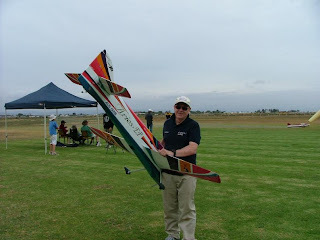 He was over here on holidays, and managed to stumble across the Model flying field (haha). It was nice of him to come out, and it was great to meet him . . he is a great guy. The Saturday night Dinner was held at the Mawson Lakes Hotel. Good meals, a few drinks, and pleasant company was the order of the evening before retiring to contemplate the forecast of strong winds for Sunday ! Sunday dawned with predictions correct. Strong winds greeted us at the field with no indication (or forecast) of it easing up. A general meeting was held, followed by a P-11 technical forum before some decided it was too windy to fly. Anyway . . that was officially the end of the competition. 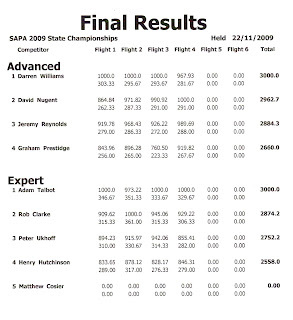 Advanced and Expert managed to fit in four rounds on the Saturday, while F3A only had three flights meaning they ALL had to count. Yes . . I was reasonably disappointed, having only two scoring rounds available. I guess that’s the luck . . Presentations were made and the Interstaters managed to get an early start on their trip home. In general, some good flying and great company as always. The results are posted below, and generally, were as expected I guess . . So now we look forward to 2010 with new schedules and some new planes in the works, so I expect we will all be looking forward to that. Early January we have a flying and judging clinic with a BBQ coming up at Mildren’s Flying Field . . stay tuned for more news ! Wishing you all a Merry Christmas and a great New Year . .